Epic fantasy does not get better than this. Well before The Fifth Season was awarded a Hugo for Best Novel, the only concern I felt about The Obelisk Gate was in regards to whether or not it could possibly be as good as The Fifth Season. Could Jemisin meet the high standard she set with the first novel, let alone surpass it? The Fifth Season wasn't just good, it was exceptional. Time has only strengthened my thoughts and feelings on The Fifth Season (my review) and the more distance I have from that first experience of reading and discovery, the higher my regard for what Jemisin accomplished in The Fifth Season. I needn't have worried. In some ways, The Obelisk Gate is necessarily a different novel. The Fifth Season opened with a world breaking cataclysm on a world that is well familiar with cataclysm, but somehow Alabaster's breaking of the world paled in comparison to the three deeply personal stories of Damaya, Syenite, and Essun and their respective heart wrenching tragedies. The Obelisk Gate remains deeply personal, but Jemisin brings two things with global consequences to the forefront. First, the world breaking volcanic destruction Alabaster caused in The Fifth Season? The impact of that dark, choking ash becomes paramount as Essun pauses her search for her missing daughter to stop at the comm Castrima, though just to write that is an insanely gross simplification of Essun's storyline. The pause in Essun's search comes from the knowledge that her old lover and mentor, Alabaster, was at Castrima and he was dying, turning to stone. The appendices of both The Fifth Season and The Obelisk Gate detail out all of the different "Seasons" the world has had over thousands and thousands of years, those world killing events used to mark time and which cull humanity again and again, wiping out progress and civilizations until humanity could rise again (only to be choked back down). The resultant ash from Alabaster's destruction heralds the arrival of a new Season, and through Castrima, we see how a comm begins to tighten and hunker down in the hopes of outlasting and outliving a Season - except the unnamed narrator throughout both books has told us that this isn't a Season which will last just a couple of months or years, but thousands. Essun knows how bad it will be, but what choice does she have but to survive? Second, there are hints very early on in the novel that the moon is going to come into play and just the bare mention of this, just the idea that this is a thing that could be possible (and how it could be possible) is both jarring and awe inspiring. This is not to say that The Obelisk Gate is not as deeply personal as The Fifth Season. It is. Through both Essun's and Nassun's storylines we learn of the actual relationship between mother and daughter and having read The Fifth Season's portrayal of Essun's desperate search for Nassun, it's heartbreaking. Jemisin reveals so much of how Essun's life and training as an orogene at the Fulcrum has shaped her - not just how it led Damaya to become Syenite to become Essun and all the tragedy that story entailed, but how all of that truly shapes a person deeper into the relationships they form with their families. How it all matters. 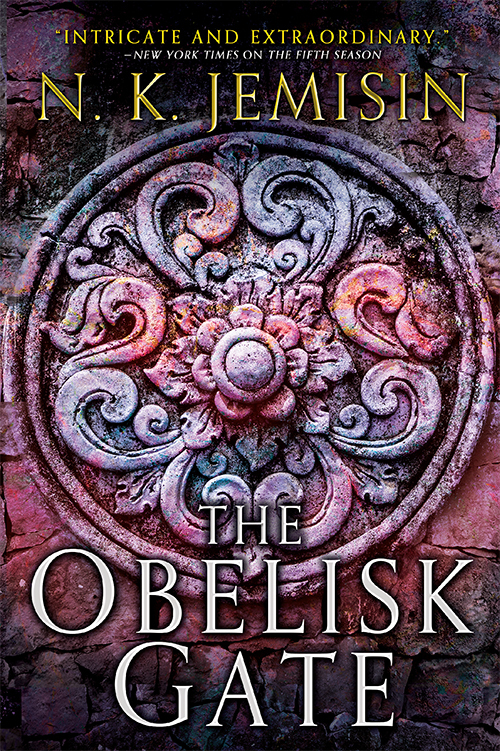 The Obelisk Gate is not specifically a story about family, but then Jemisin is not telling a story of just one thing. She's weaving a rich and brilliant tapestry that pulls from family and destruction and loss and hope and love and disappointment and oppression and earth magic and everything else that can be mixed in with individual threads forming larger weaves and all coming together into something far greater and far more beautiful than a description of any individual thread could get across. There are so many different aspects of The Obelisk Gate to talk about. There is the viewpoint chapters of Nassun which expand on everything we think we know about the world and how her power and her journey will shape everything to come. It is through Nassun that we learn so much more about Essun and Jija (the father that murdered Essun's son / Nassun's brother) than we ever could have through Essun's eyes. The viewpoint chapters of Schaffa, the guardian who trained / abused Essun are a revelation, especially in the context that everything we know of him comes from Essun's perspective. This doesn't touch upon the new explorations of orogeny and the ideas of how different methods of training lead to different uses of the power and different beliefs about what uses are even possible in the first place. One question that I did not ask while reading The Fifth Season but which came to mind early in The Obelisk Gate is "just who is narrating this book, anyway?" It matters and it matters far more than I had anticipated because Essun's chapters in The Fifth Season were presented in the second person and this choice continues with The Obelisk Gate. Inattentive reader that I am, I assumed and accepted that Jemisin's use of second person perspective for Essun was mostly a stylistic choice used to subtly distance the reader from Essun and that distancing was also partly reflective of the severe trauma she had just been through coming across the murder of her son by her husband, let alone the traumas we didn't yet realize she had also been through. This time, however, something tipped me off there was something else going on and this wasn't just the story of Essun, that there was another very important story being told through the narration of Essun's story. That narration builds not just greater background for the world itself, but also hints at a larger conflict that moves beyond just the lives Essun and Alabaster and Nassun think they are living. They might be pawns. They might be more. 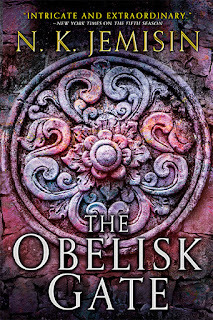 There is so much going on in The Obelisk Gate and Jemisin has so many balls in the air that a lesser writer would have begun to drop them by now. Not Jemisin. She is fully in control of The Obelisk Gate. Penalties: -1 because some might find issue with the slower pacing.